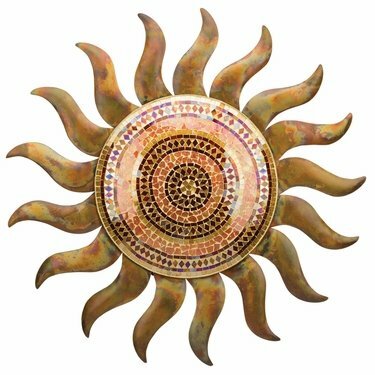 The easiest way to bring sunshine to your home all year long is with a fabulous piece of Sun Decor, and we've just combined our special mosaic and crackled glass style to make this impressive 29" Flamed Copper Mosaic Sun! A domed center adds dimension and sparkle from many angles. Clear lacquer is applied to make it weather resistant for outdoor use. This gorgeous sun is made of durable metal and glass and will look absolutely stunning in your home or garden! Even more impressive than this picture can show, you will love how this sun decor instantly brings beauty and warmth into your life. Place it indoors, in your office, by your patio, or on a wall or fence in your garden so the sun rays can beam all around. Outdoor sun decor has never looked this good!